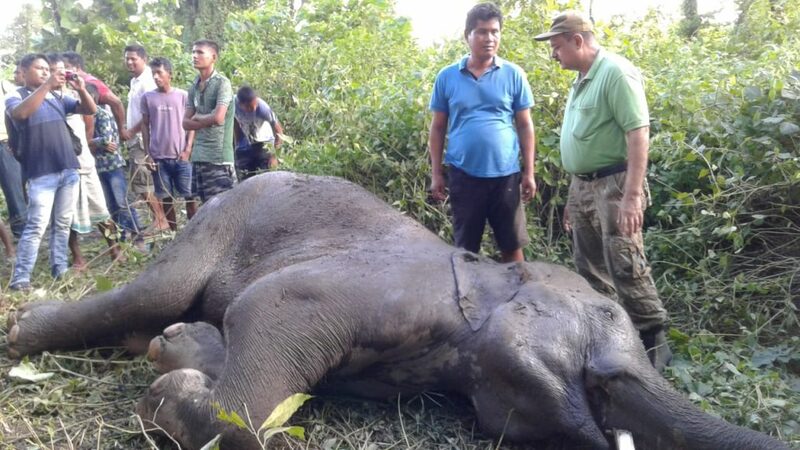 In a tragic incident, a wild jumbo, which had been battling for life since the past few days at Borongabari village near Santipur along the Indo-Bhutan border in Udalguri district, diedon Thursdayevening. The elephant, a makhana (male elephant without tusks) and 7 ft height, was witnessed in the bamboo forest on the backyard of one Dhireswar Deka, by villagerson Wednesday. The forest officials immediately responded and the district veterinary doctors led by Dr Surlov Sarma reached the spot to treat the jumbo. The site of the incident under Nonai Forest reserve forest, bordering Indo-Bhutan, is an elephant corridor, about 30 km from the district headquarter, Udalguri. Locals had provided food and water to the injured animal informed the forest officials. Meanwhile a team of expert wildlife surgeons from the Centre for Wildlife Rehabilitation and Conservation headed by elephant veterinarian and Professor of Surgery and Radiology at the College of Veterinary Science, Khanapara, Dr Kushal Konwar Sarma, fought a day-long battle inside the jungle to save the wild jumbo which was in a frail state. But, in an anti-climax, the efforts of the team to save the jumbo failed to fructify as it died in the evening. Forest Department sources said that it was a nearly 18-year-old male wild jumbo which might have collapsed during an infighting among wild elephants.